Note: This a very lengthy post. So, it’ll be a good idea to read it first thing in the morning when your mind is fresh and while you’re having your wake up coffee (or tea, or milk, or cold water, or nothing). Another note: This is a very technical and a very advanced post. It is mainly aimed for developers, but non-developers can still enjoy it nonetheless, or can just scroll down to the bottom of this post for the chart. So far, we haven’t upgraded any of our customers to Joomla 3.8.x, and this is because we learned our lesson a few years ago to wait a couple of months before updating to the latest version of Joomla (unless, of course, the update is a major security patch). However, we are very close followers of the Joomla community, and we have read and heard many comments about the bad performance of Joomla 3.8 when it is compared to Joomla 3.7. We did communicate these concerns to the Joomla developers, who discovered that some events were triggered twice in Joomla 3.8.0 (leading to a major performance issue on large Joomla sites), and who fixed that problem in 3.8.1. So, is Joomla 3.8.1 faster or slower to Joomla 3.7.5? In this post, we decided to benchmark Joomla 3.8.1 against Joomla 3.7.5, in order to provide a definitive answer to the question. From the exclude line (which is the second line in the file), we removed the httpd* entry, to allow the install of the ab tool through yum. We saved the file and exited vi. (Note: If you see No matches found when you issue the above command, then try contacting your host). For the server, we added the same lines above in the /etc/hosts file. At this point, we were ready to install Joomla. We installed Joomla 3.7.5 on joomla375.com and Joomla 3.8.1 on joomla381.com (we will spare you the boring installation details), and – we chose to include the blog test data for both. joomla375.com and joomla381.com ended up being identical sites. We then restarted MySQL. In case you’re wondering, the above 2 lines will log any query that hits the database server to the all-queries.log file (located under /var/lib/mysql/ folder). Typically, benchmarking is done by issuing a number of concurrent connections to the website for a specific amount of time using a benchmark tool such as ab, then examining the results and comparing them to a different website. However, since we are working on 2 identical websites using the same CMS with a different version, we thought that it’s a good idea to add another metric to the test, which is the size of the query file generated by a page load (or a number of pages loads). In other words, we load the homepage of each Joomla website, with the general_log on, and we compare the size (in bytes) of the all-queries file generated by each Joomla website to the one generated by the other. We will consider that smaller is better (we agree that it is not an accurate benchmark, since the complexity of a query is not always proportional to its string length). We first loaded the homepage of the Joomla 3.7.5, and we examined, the size in bytes, of the all-queries.log file, and it was 21473 bytes. We emptied the all-queries.log file, and we did the exact same test on the Joomla 3.8.1 website. The size of the file was 18552 bytes. For us, it was a shocking surprise, because we expected the complete opposite. We didn’t expect Joomla 3.8.1 to have about 3 KB less queries than Joomla 3.7.5, so naturally, we were curious. We compared the 2 files and it turned out that Joomla 3.8.1 got rid of all the unnecessary (and never used) references to the #__content_rating table. We did mention the unnecessary references to the #__content_rating table before, and it seems that someone from the Joomla core team was listening then. Other than the removal of the #__content_rating table, we didn’t really find much difference between the 2 files. They were almost identical. Logging in to the Joomla website. Adding a user with default privileges. Adding an article to the Blog category. …was literally 45 times in the log file. These 375 queries didn’t exist in Joomla 3.7.5 (375 queries didn’t exist on Joomla 3.7.5, is it really just a coincidence, or were the developers trying to tell us something? ), and these 375 queries resulted in the 30% increase in the size of the log file. ab -c 10 -t 10 "http://www.joomla375.com/"
ab -c 10 -t 10 "http://www.joomla381.com/"
The first command was used to benchmark the Joomla 3.7.5 website, and the second command was used to benchmark the Joomla 3.8.1. So, which one did better? The above means that we are sending 10 concurrent (or simultaneous) connections (-c 10) for a maximum of 10 seconds (-t 10) on the website http://www.joomla381.com/ (Note: adding -k to the above command will force the use of the HTTP KeepAlive feature). Going back to the results, at first glance, it is very obvious that Joomla 3.8.1 did much, much better than Joomla 3.7.5. In fact, Joomla 3.8.1 was able to process 50,000 requests in 2.643 seconds, while Joomla 3.7.5 only processed 737 requests in 10 seconds. The time per request for Joomla 3.8.1 was a a very impressive 0.529 milliseconds, while that of Joomla 3.7.5 was a very slow 135.688 milliseconds. So, if we were to end this article now and we were to use this benchmark data, then we can conclude that Joomla 3.8.1 is 257 times faster than Joomla 3.7.5. This is just too good to be true – more like unbelievable (and rightly so, as you will learn later in this post). So we closely examined the above numbers and we noticed that there was some kind of cheating going on. You see, while the Joomla 3.7.5 website responded with 18052 bytes (this is the Document Length), Joomla 3.8.1 responded with a mere 328 bytes. Clearly, the Joomla 3.8.1 website wasn’t giving the full response. Aha – the website was returning a 403 error, and then it hit us, we denied, in the .htaccess file of the Joomla 3.8.1 website, all IPs from accessing it with the exception of our IP; so we needed to add the IP of the server as well. The Joomla 3.7.5 website didn’t have the problem because the server IP was already authorized in an allow statement in the .htaccess file. So, it wasn’t really a conspiracy or cheating or foul play or anything (it’s always easy to blame the poor Joomla development team for anything), it was just us being tired. So we decided to continue our experimentation the next morning. Now it’s more like it. The document length was 18691 bytes, which is very close to the 18052 bytes returned by the Joomla 3.7.5 website (by the way, it would be interesting to know why there is a 639 bytes difference between the 2 – but it’s really outside the scope of this post). The number of completed requests is 714 requests, with a mean time of 140.583 milliseconds. The Joomla 3.7.5 website, in case you don’t feel like scrolling up a bit, handled 737 requests with a mean time of 135.688 milliseconds. 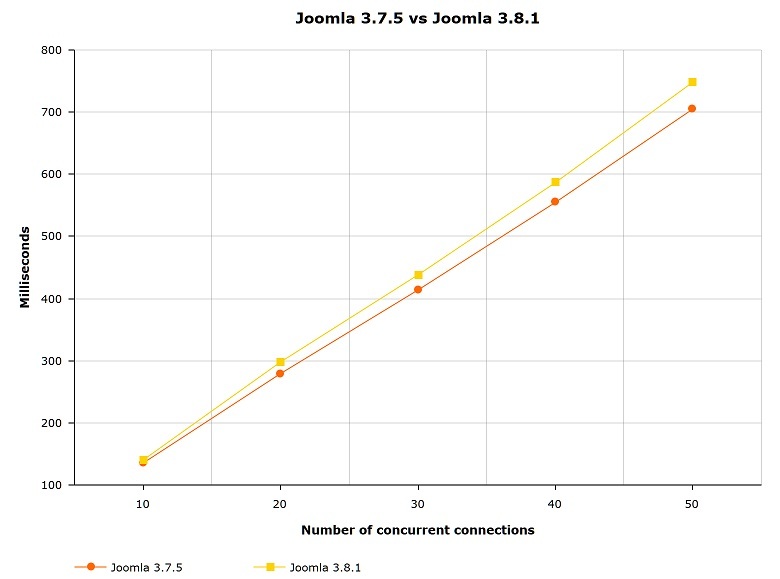 You can see in the above chart 2 things: 1) Joomla 3.7.5 consistently performs better than Joomla 3.8.1, but only slightly, and 2) the 2 lines diverge more with the number of connections. In fact, Joomla 3.8.1 is 3% slower than Joomla 3.7.5 with 10 concurrent connections, but with 50 concurrent connections, it is 6% slower. So, there you have it. Joomla 3.8.1 is slower than Joomla 3.7.5, and we’re totally not lying with stats charts (please trust us!). In fact, you can conduct the same test yourself and you will likely get similar results. We hope that you found this post informative and that you had fun reading it. If you have any questions about it, or if you need help optimizing your Joomla 3.8.1 website, then all you need to do is to contact us. Our fees are affordable (and haven’t increased for the past 7 years), our work is clean, and we are the friendliest Joomla developers in the Milky Way (unless, of course, Mars turns out to be populated by extremely friendly Joomla developers).